The average cloth diapering family has at least 30 diapers. Which doesn't sound like much when you're used to disposables, since it's not uncommon to buy disposables in packs of 40. However, disposables are all the same. They also don't take up a lot of room. And you don't need to store them for long: after you've used them, you throw them away. So for families who use disposables, organizing diapers is simple: you take a handful of diapers out of the box and stick them in one side of the changing table drawer. But thirty pockets or all-in-ones would never fit in half of a changing table drawer. And many cloth diapering families have a lot more than thirty diapers. Especially if you're diapering your second child and have diapers in various sizes, it's not unusual to have a hundred or more. Worse, it's rare to find a cloth family that has only one type of diaper. With so many types to choose from and so many different brands, most cloth diapering families have a varied stash, with different types of diapers for different occasions. So organizing cloth diapers presents unique challenges: not only do you need enough space for all your diapers, but you also need to be able to find a specific type of diaper when you need it. 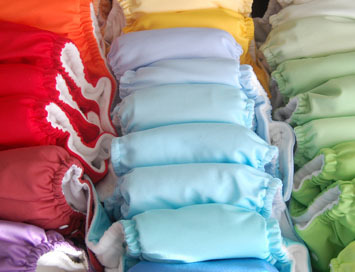 How should you organize your cloth diaper stash? Here are some ideas. 1. By type. The simplest, most obvious way to organize your cloth diapers is by type. Get as many drawers, baskets, or other storage compartments as you have types of diapers. Then put each type of diapers in a different basket: pockets in one basket, all-in-ones in a second, fitters in a third, and so on. Use a separate basket for covers and still another for accessories like Snappis and wipes. This method has the advantage of simplicity and ease: you'll always know where to find a specific type of diaper. If you use different types of diapers for specific needs, such as pockets at night and flat folds during the day, then this is the best method for you. However, it does have one important disadvantage: it can take up a lot of space. If you have many different types of diapers, or if you have only one or two of some types of diapers, then this may not be an efficient use of your storage space. 2. By ease of use. You can solve the space problem by grouping more diapers together. One basic way to do this is by ease of use. For example, put all the diapers that don't need a cover, or diapers in which the inserts snap in, in one drawer, and put all the two-step diapers (that require you to put on both the diaper and a cover separately) in different drawer. One drawer would then hold pockets, all-in-ones, and all-in-twos, while the other would hold prefolds, flat folds, fitters, inserts, and covers. Again, any accessories like Snappis should probably go in a third location, although they could go in the two-part drawer. This method of organizing is best for families in which multiple people change diapers but not everyone is knowledgeable about cloth. For example, if you usually use flat folds because they dry quickly but your mother babysits during the day and refuses to fold diapers, this method allows you to create a "babysitter drawer" that holds all the diapers that are easy for the babysitter to use. The disadvantage of this method is that different types of diapers may get mixed up together in a confusing way. For the one-step drawer, that's not a problem, since the diapers are all one-step for putting on anyway. But for the two-step drawer, you may find that it's hard to match a fitted with the cover that suits it best, or your flat folds and prefolds may get mixed up together. 3. By color. Does it sound silly to organize cloth diapers by color? It may not be. If, for example, you have two children in diapers, you might find it easiest to sort out which diapers are for which child by color. Or if you care a lot about matching your baby's diaper to his outfit, then this method might make the most sense for you. It will enable you to make sure your baby's diaper will make an impressive fashion statement all day long--and it will make it easy to pack diapers for the day that match his outfit as well. Which of these organizational methods is best for you? It depends on how you choose your diaper at each change. Think about what criteria you consider when you're changing your baby's diaper, and use that as a basis for your organizational method. There's no right or wrong way to organize your diapers; as long as you can find the diaper you need in the middle of a change, then your method works for you.